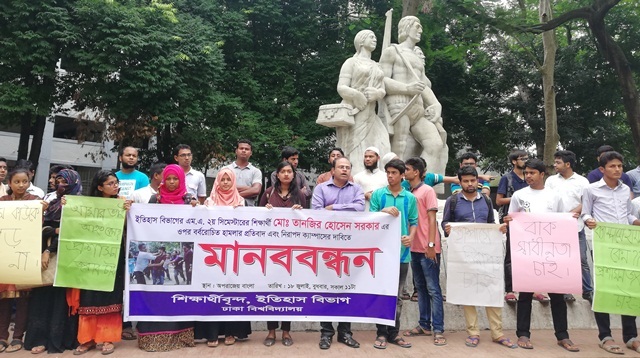 Students and teachers of History department of Dhaka University on Wednesday formed a human chain at the foot of Aparajeyo Bangla in the campus protesting the assault on a student of the department, UNB reports. They also demanded the authorities to ensure the security of the students in the campus and exemplary punishment of the attackers. Tanjir Hossain Sarker, a second-year master’s student of the department, was among teachers and students who were allegedly assaulted by ruling Awami League-backed Bangladesh Chhatra League (BCL) recently while protesting the arrest of quota reform activists. “If democracy is there in the country why people cannot stand for their rights?” he added. While speaking at the human chain, Prof Mohammad Abul Kawser of the department urged the government to take necessary steps to consider the logical demand of the students.